The end of the year is approaching quickly and some Beach Clubs have already wrapped up for the year. We’re thankful that we’ve had the opportunity to minister to 11,754 children this year and for the 2,525 volunteers to make these moments possible. First Baptist Church Highlands invited the Beach Club kids and their families to attend a Sunday church service. The kids sang one of their KBC songs to lead the congregation in worship. KBC volunteers also were recognized. After church, KBC clubbers and their families joined the church family for a carnival complete with hot dogs and clowns. Faith Baptist Church, Bartlett, Tenn.
Fifth graders moving on to middle school received a 4x6-inch scripture frame and a 4x3-inch graduation sticker for the inside cover of their Bible. 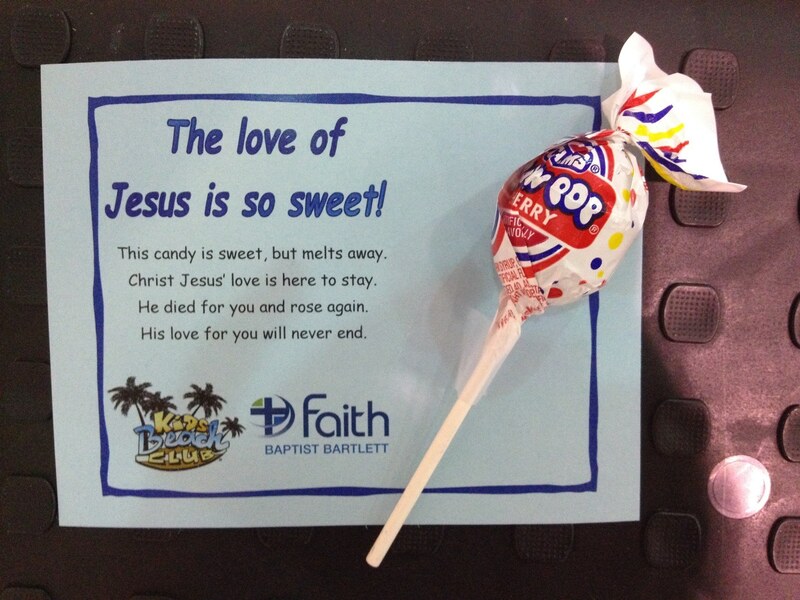 All students received a "the love of Jesus is so sweet!" card with candy. First Baptist Church in Kemp threw Beach Club kids a pizza party on the last week of club. They recognized kids who have been part of KBC for all three years the club has been meeting, awarding each kid with a KBC t-shirt. Calvary Baptist Church, Clearwater, Fla.
Special awards were given to kids who had perfect attendance since coming to KiDs Beach Club®. Seven children in the club had not missed a day since joining KBC. One child has been to every club meeting for two years! Another eight clubbers have only missed a day or two. Praise to the Lord for these faithful children! Chris Bridges, the pastor of children’s ministry at Calvary Baptist Church, came to club to answer questions the kids had submitted in previous weeks. He presented each child with a devotional book and announced the church would provide scholarships for any KBC kids who want to attend their church’s summer camp. Brown Missionary Baptist, Southaven, Miss. During a Saturday evening service, the church baptized nine students who had made Jesus their Forever Friend at Beach Club this year. It was a great time of worship and fellowship between the church families and these Beach Club families. Click the video below to hear pastor Jeffery Jackson tell the story about how he will baptize an entire family thanks to one girl's participation in KiDs Beach Club®. Jeffery_Jackson_Brown_Missionary_Baptist from KiDs Beach Club on Vimeo. For many kids and volunteers, KiDs Beach Club® is the highlight of their week. While it’s hard to say goodbye at the end of every school year, we trust that the seeds of faith that were planted will take root and that kids will continue to follow Jesus like they were taught in clubs. To our sixth graders and others who are leaving Beach Club for a final time, we’re grateful KiDs Beach Club® has been a part of your lives and pray those seeds of faith that were planted will help guide you as you head to your next school and beyond. To the rest of you, we are already looking forward to our first meeting next year. It’s hard to believe summer is just around the corner. Enjoy it! Be on the lookout for our Summer Reading Plan so you can keep reading and studying your KBC Explorer’s Study Bible. It's not too late to share what your Beach Club is doing or has done to celebrate its final meeting of the year. Email your story to news@beachclubs.org or tag #KiDsBeachClub on Facebook, Twitter or Instagram.